No one wants to replace their hot water heater before they have to. The good news is that regular maintenance and proper care, your hot water heater could last for decades. Keep reading to discover some of the essential maintenance tips for keeping your water heater in great shape. If you need help, or you want to learn about the latest innovations such as tankless water heaters, contact The Stanley Louis Company at 800-217-6527 today. Your hot water heater is going to last longer – and work better – if the tank is flushed yearly. This gets rid of any sediment, rust, or other hard water issues that could be building up. When these elements are flushed, the water heater is able to work more efficiently. The harder it is to heat your water, the harder your unit needs to work – which can shorten its lifespan. Ensuring it runs as efficiently as possible is also a great way to save money on your utility bills. You may not think of this as a maintenance step but if you have numerous people in your household, you may be surprised by how often others change the temperature. We suggest keeping it at 120 degrees. This prevents scalding while also getting you the heat you need. Check it every six months or any time you notice that your utility bills have gone up for seemingly no reason. What of the best things you can do to prolong the life of your hot water heater is to use a water softening agent. Hard water is full of minerals and those minerals can settle in the bottom of your tank. While you should be flushing them once per year, using a water softening agent prevents them from being there in the first place. A unit without hard water is a unit that is going to run more efficiently – which means it will last longer too. This is another step that The Stanley Louis Company will take when we come to you for your maintenance needs – we will check the burner on your heater. The flame should always be blue with yellow tips. If you notice that it is more yellow / orange then this may be sign that there is incomplete burning. 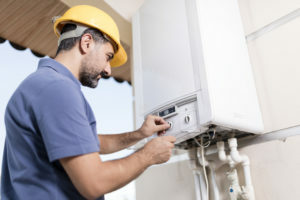 That’s an issue not just because of the poor water heater performance it’s causing, but because it can result in the deadly production of carbon monoxide. If you see that your water heater burner is not burning properly, that is cause to call for an emergency repair. Do you have other questions about maintenance? Do you want to schedule a maintenance call from a professional? Call The Stanley Louis Company at 800-217-6527 right away.